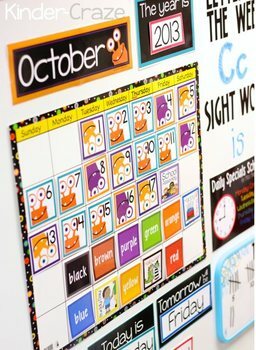 This is a collection of 12 labels to place above your classroom calendar. 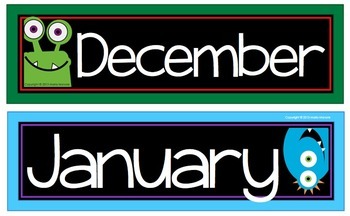 These monthly headers feature fun seasonal colors and monster graphics with a bold black background. They are formatted to print on legal-size paper. Once trimmed, the printed headers measure 4x13”. For lasting durability, mount the headers on construction paper and laminate before use. 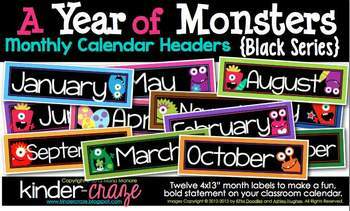 Coordinating monster number cards for each month can be purchased here. Images Copyright © 2012-2013 KPM Doodles and Ashley Hughes All rights reserved. 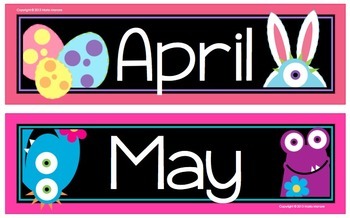 Visit the Kinder-Craze blog for freebies and great project ideas.